We’re bringing 2013 to a close with a look at 12 of Toyota’s biggest cars and concepts in 2013. Take a look at some of the images that sum up Toyota in 2013. Take a look at our round-up of the Goodwood Festival of Speed 2013 in words, pictures and video. See how the FT-86 Open ‘Shadow Dodging’ film was made in this video. 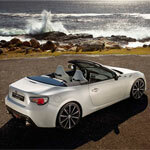 Watch the latest videos of the new Toyotas revealed at the 2013 Geneva motor show. The Toyota GT86 has been shortlisted for the 2013 World Car of the Year title. The covers have been pulled from the spectacular new FT-86 Open Concept at the 2013 Geneva Motor Show. Take a look at this amazing new video of the FT-86 Open concept, ahead of the car’s reveal at the Geneva Motor Show.